The 10th edition of the Canadian Championship, Canada Soccer’s pinnacle club competition, will kick off 3 May in a head-to-head elimination series when Ottawa Fury FC host FC Edmonton at TD Place Stadium in Ottawa, with the return match 10 May at Clarke Stadium in Edmonton. The opening matches of the Battle of the North between Ottawa Fury FC and FC Edmonton will be livestreamed on CanadaSoccerTV (www.youtube.com/c/canadasoccertv/live) starting at 19:15 ET (17:15 MT) 3 May from Ottawa and 21:15 ET (19:15 MT) 10 May from Edmonton. The two-match qualifying series sets the stage for an epic Battle of the North with the chance of international glory on the line. As the only all-Canada competition that leads to the international stage, including the CONCACAF Champions League and FIFA Club World Cup, not only will the Canadian Championship winner claim club soccer supremacy in Canada, but it will have the chance to carry Canada’s flag in international competition. New Canadian Content rules introduced by Canada Soccer in 2017 include the requirement that a minimum of three Canadians are in the starting lineup for all Canadian Championship matches which will result in more Canadian players taking the pitch than in any previous editions of the competition’s ten-year history. The Canadian Content rule builds on the youth development initiatives announced last year, in collaboration with MLS, that include the expansion of the Homegrown Player parameters to ensure that Canadian youth players in MLS club academies or Canadian approved youth clubs will be considered as domestic players in MLS. “By ensuring that at least three Canadians are included on every starting lineup throughout the competition, we are showing our continued commitment to the development of Canadian talent in our country. 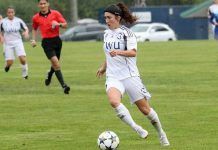 This commitment extends to plans to expand the Canadian Championship for future editions to include winning teams from both League1 Ontario and Première Ligue de soccer du Québec,” said Montopoli. The path to the FIFA Club World Cup will start at home with the Qualifying Round, whose winner will join Canada’s three MLS teams for home and away Semi-final series. The home and away Final round will culminate with the final match on 27 June where the winner will be crowned 2017 Canadian Champion and raise the Voyageurs Cup. A special one-match Battle of the North playoff between the 2016 Canadian Championships winners Toronto FC and the 2017 winners will be played on 9 August in Toronto to determine who will advance, unless Toronto FC repeats as Canadian winners.